New Englander's have long embraced local agricultural. Community farming has been a way of life since colonial times on the outskirts of Boston and beyond. But that role is no longer limited to wide-open landscapes in rural areas. One farm is redefining the rules of agriculture, shaping how city-folk think about farming, and is changing the way Bostonians eat. Meet Higher Ground Farm, owned by long-time friends and “soul-mates” Courtney Hennessey and John Stoddard. They’re on a mission to increase access to fresh, healthy food in Boston, and contribute to the sustainability of our food system. The two, who met at the University of Vermont on their second day of college, say they never would have believed how their lives have unfurled. But here they are 14 years post-college, and hundreds of feet up, cultivating Boston’s first rooftop farm atop the Boston Design Center. Now in their second growing season, the farm is getting an earlier start and the crops are starting to come in. But despite the abundance of crops and an already flourishing network of buyers, they insist that the road to the roof was not a quick and easy one. Upon graduation from UVM in 1999, Courtney moved to Massachusetts to work for The Food Project and John went out west to work in Portland, Oregon. In 2005, their paths re-aligned when John moved back to Boston and the two began a long stretch working in the restaurant business. It wasn’t until 2010 that the two started drumming up plans for their dream farm, and Higher Ground began its long journey to reality. They started with funding, launching a Kickstarter® campaign and subsequent fundraisers. 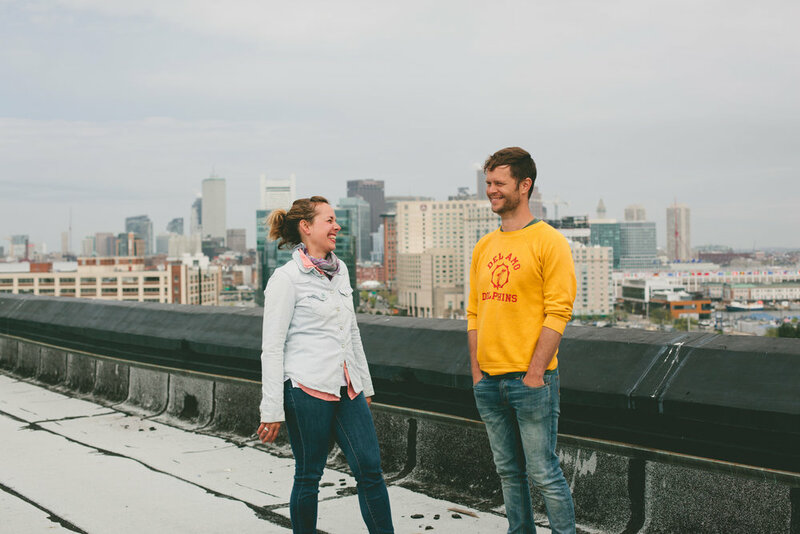 After a search of various rooftop locations, including one in Charles- town, the two settled on the Boston Design Center and signed their lease in 2012. The first growing season began in July of 2013, after months of tackling the city’s bureaucratic red tape, and hours of manual labor. On their own, and with the help of volunteers they hauled 1,400 milk crates and the organic soil to fill them up onto the roof. The farm cultivated 2,300 pounds of produce during last year’s short growing season, and this year they expect to grow even more. Getting to Higher Ground Farm is no easy task, but the journey and the view up top are more than worth the effort. To get to the rooftop, we took an elevator to the top floor and then ascended a slightly perilous set of stairs. 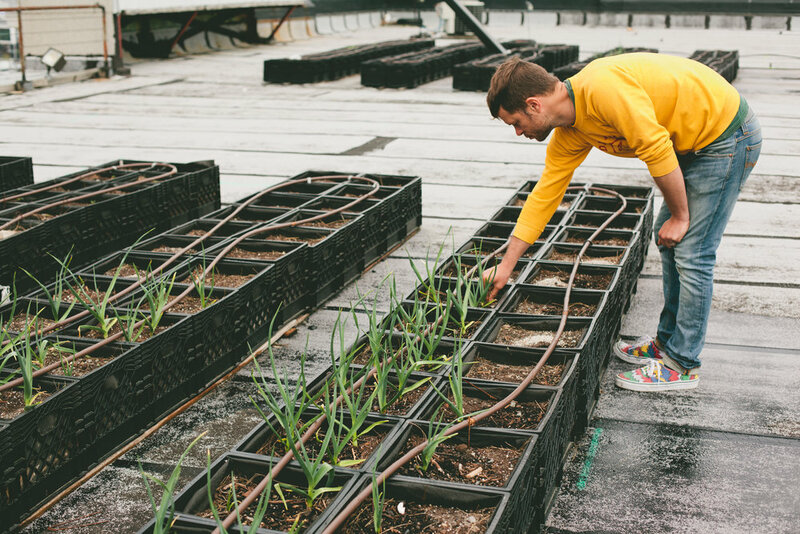 From there we stepped out onto the farm’s staggering 55,000 square feet of rooftop growing space. Currently, they grow primarily salad greens, tomatoes, and edible flowers in rows upon rows of planter beds. This year they plan to experiment with cucumbers and summer squash as well. The plants are watered two times a day by a complex irrigation system that snakes through the planter beds. According to Courtney and John there are definitely some challenges to farming on an expansive roof-top – namely, the high winds from off the ocean and seagulls. During our visit to the farm several gulls had already taken up residence on the rooftop where they will lay their eggs and protect their babies from predators. And unfortunately they can’t distinguish between a dangerous hawk and a friendly volunteer. Needless to say, Courtney and John will be relocating the seagulls. They also initially worried about pollination on the rooftop, but nine beehives housed on the roof of the Seaport Hotel have helped the process along. Throughout Courtney and John’s many years in the restaurant business they built many strong relationships in the Boston restaurant community, and now those people are the support system that has helped their business get off the ground. Currently, Higher Ground Farms sells most of their produce to local restaurants in Boston. The list of top-notch restaurants includes Tres Gatos, Ten Tables, Toro, Coppa, and Tavern Road just to name a few. They also sell in one retail store called American Provisions. This coming year they will be adding Myers and Chang to their roster. If you want to get your hands dirty, the farm offers several volunteer opportunities throughout the summer. Volunteers can help out with a variety of tasks, from planting tomatoes to carrying milk crates up to the rooftop for planting. In 2013, they had around 50 people at every volunteer event, so be sure to sign up well ahead of time. You can help Higher Ground take their farm to the next level. Courtney and John have big plans for their rooftop farm. In the future they hope to gain public access to the roof so they can create an event space, and a place where they can hold educational events for kids and adults alike. They have even toyed with the idea of hosting supper clubs and dinner pop ups. And of course, they will continue on their mission to deliver fresh, healthy food to Bostonians, and educate our community on the benefits of rooftop farming.